Ok, so I got a nail polish because it reminded me of a candle. I know that's weird because the nail polish doesn't smell like the candle, but it kind of looks like the candle? That sounds even weirder. I'll put it together for you. One of my favorite holiday candles at Bath and Body Works is Cranberry Pear Bellini, it has this bright fruity cheery scent that is divine. Look at the packaging I linked above, is that not KBShimmer Toast-ess With The Mostest in candle form? Color: I love this color combination. Pink with gold and silver is awesome, it's so festive and fun. Yes, it also reminds me of my favorite candle. I love cheery, sparkly, and shiny polishes that are meant for the holidays, but are not traditional holiday colors. Formula: I used 2 coats above. I will say with the larger glitter circles the formula can be a bit tricky the casual polisher like myself, but nothing overly troublesome at all. 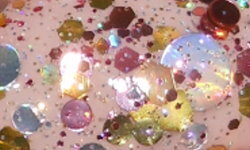 Price: I got this for $8.75 on KBShimmer's website. Overall: Great festive holiday topper that is girly, frilly, and fun! I love it so much I'd say it's a must have. Gorgeous, this is one of my faves from this collection, for sure. That candle sounds amazing :D and this manicure looks amazing, too!